Series producer Koji Igarashi tells Kikizo about his new game, getting his old one on Xbox Live Arcade, and why making a 2D console game isn't likely. 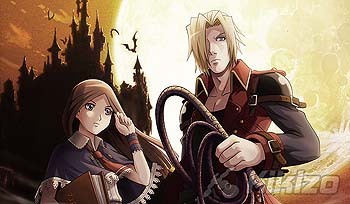 The Castlevania series has a long history of wowing gamers looking for action-heavy 2D adventures. Konami and series designer Koji Igarashi have experimented with 3D, but it's the more traditional games that have always drawn the acclaim. For the latest instalment, Castlevania: Portrait of Ruin, the creators are bringing in a few new tricks. The most obvious addition is that of a second character. You'll play as both Jonathan Morris and Charlotte Orlean in Portrait of Ruin, switching on the fly to use their specific skills to get around obstacles and fell bosses. Exploration has always been key to the Castlevania experience, and Igarashi explained to Kikizo recently that this is the biggest world yet. Unlike previous outings that have confined players to castles and the like, Portrait of Ruin ventures outdoors from time to time too. Igarashi says there are more enemies than ever this time, which adds to the collecting trend that runs through the game. This stretches to shop areas, where you can buy in-game items and also buy items from other players over WiFi. Music in Portrait of Ruin is again courtesy of series composer Michiru Yamane, who also worked with ActRaiser's Yuzo Koshiro to refine the haunting soundtrack that permeates the experience. "I had more freedom with composition and I really like the way I was able to contribute to this," Yamane told Kikizo. Getting another portable 2D Castlevania game is all well and good, but what many people want to know is when - if ever - we'll see another 2D instalment on a console. Igarashi is eager, but he suggests that perhaps the average person just isn't interested in it. "As you know I love 2D game development!" he said. "I am working really on an underground basis to make it happen on a console game. But then again when you look at the mainstream market, it doesn't want 2D console games." Igarashi did ask his team to experiment with bringing the series to Sony's more powerful portable, but according to him they protested: "Please, we can't do this on PSP!" This was a big reason why recent Castlevania games have come for the comparatively simpler DS instead. That's not the end of it, though. The Castlevania series may have largely skipped passed any of Microsoft's systems, but the last great 2D console instalment, Castlevania: Symphony of the Night, is headed to the Xbox Live Arcade sometime in 2007. There is, however, a problem. Microsoft has set an upper limit of 50 MB on Xbox Live Arcade downloads so that people with only a memory card and no hard drive can still download games. How will a full PlayStation game be squashed into that? Igarashi thanks the latest compression technology for that feat, but he admits that he's not involved in the day-to-day process of bringing the game over. "Maybe what you can do is split it into three and the customer gets three parts," he joked. "I am not sure how it will work with Castlevania, but maybe Microsoft afforded us a little special treatment! But I don't really know about the details, sorry!" Castlevania: Portrait of Ruin is out now in Japan and North America for the DS. It will be released in Europe in early 2007. For more from Igarashi, check out our full video interview.